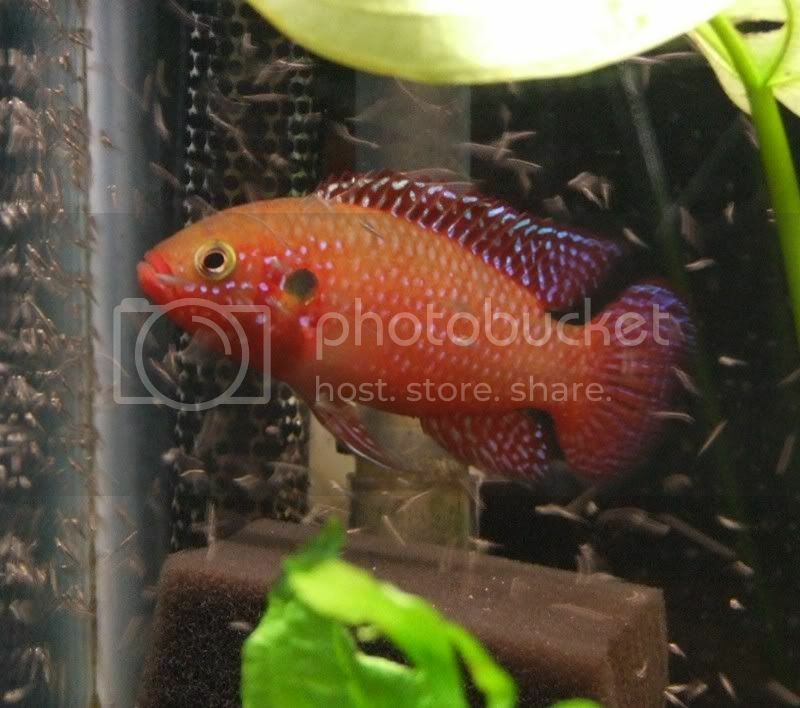 I'm just wondering if there is a way to identify the gender in Jewel Cichlids. I have a pair and I'm wondering if I could identify the sexes. I've always gone on the fact that there more irridesant blue specs on the males gill plates . The females also tend to be rounder . The pic is a little blurred but you get the idea , male above , female below . Thanks for your reply. I think my fish seem to match your description unless my brain is creating an optical illusion , because I just love to see them breed in my tank. I believe I have the right tank parameters for Jewels. Just one more related question: During/Before the mating period is there a lot of chasing around of the female by the male and also the occassional blocking and display of the most brilliant colors by the male? 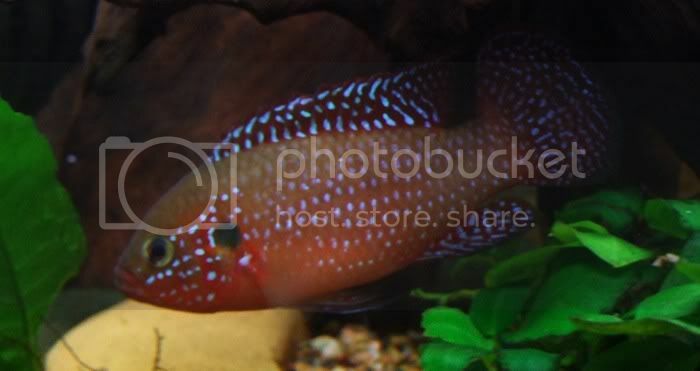 I also notice that the male in my tank(according to your description) is crimson red in color throughout the day. If you have a pair , they get a good diet and the water hygeine is looked after it won't be long before they'll start breeding for you . They do abit of chasing and displaying but you can tell by the intensity of their coloration a day or 2 before they spawn and they'll start digging . Mine always spawned on the same smooth flat rock . 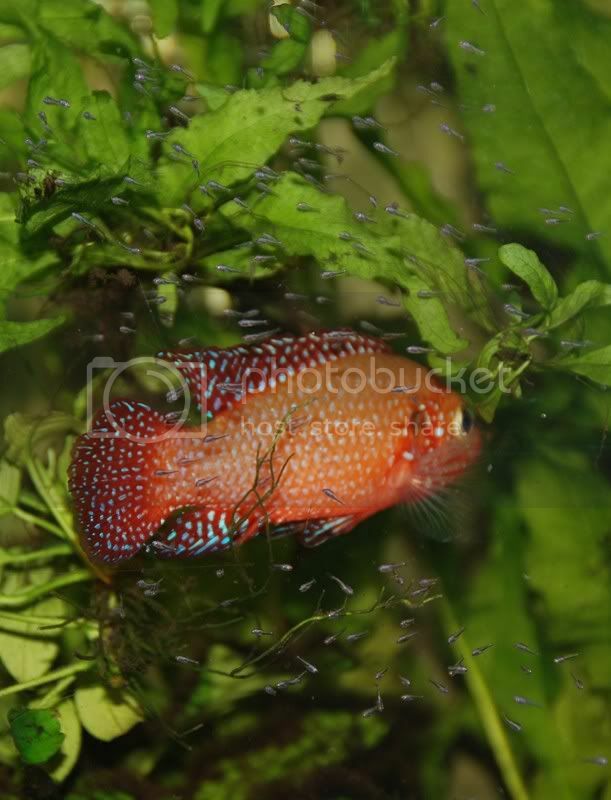 Both male and female will turn the brightest red , looks awesome with the blue dots . 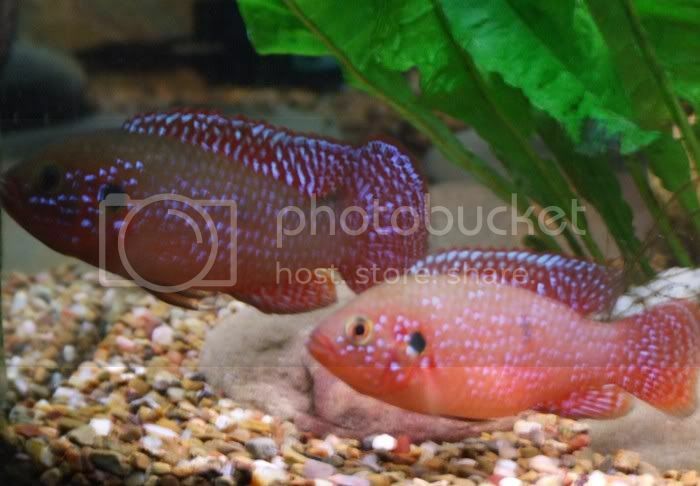 I also found that I needed to have other target fish in the tank with them as they would sometimes turn on each other while guarding the fry if by themselves . I found that the male would also belt the female up relentlessly untill she was ready to breed again once the fry were gone . Great fish but do have spousal aggression issues . Yes... I do have a loach in the tank. I do have an algae eater in the tank. But, at the moment all the chasing is focussed on the "could be" female. Thank you very much for the detailed pictorial explanation. The fish are very beautiful and the way you explain it is also very simple. I have provided them with a smooth rock as well last week. I see the fish visiting that part of the tank very often. Now, I'm just keeping my fingers crossed and hoping they are a male female pair. I'm doing 20% water change every couple of days to keep the water quality good. 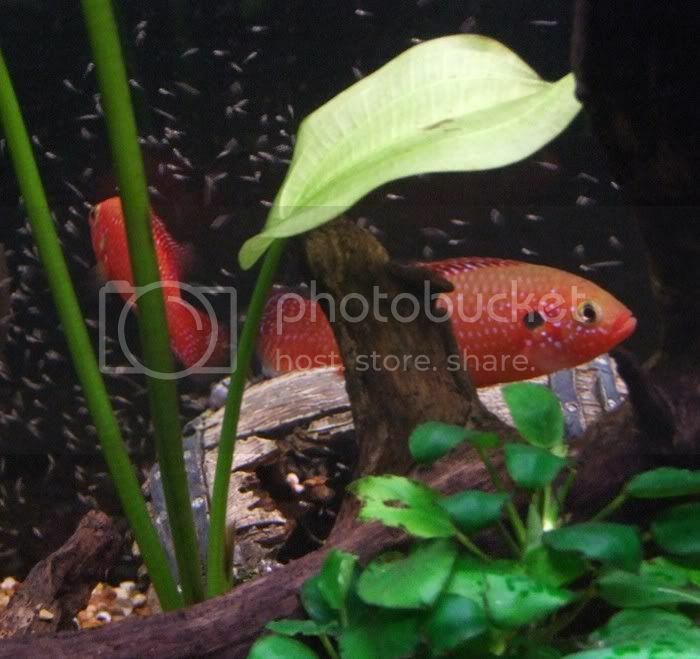 They get a varied diet like pellets, blood worms and beetles (every weekend). I'll let you know in a few weeks time if I succeed.